Each session will be tailored to your specific sport or need with a therapist trained in advanced sports therapy. Enhance performance, flexibility, and treat injuries. Bamboo fusion massage incorporates different lengths and diameters of solid bamboo sticks that are shaped to glide smoothly over the body with oil. 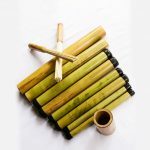 The bamboo pieces are specially designed and treated to be the perfect tools for massage. They are heated on a moist heating pad which allows the pieces to be heated to the optimum temperature thus enabling maximum retention of heat.